Quickly, easily, and affordably connects your whole home for faster movie downloads, internet gaming, and more. Instantly turns your home’s electrical wiring into a high speed Ethernet network to give any room an Internet connection. Save money and time: just plug it in, no expensive wiring or professional installation needed. Better than WiFi: up to 6x longer range, reaches where WiFi can’t. Better than WiFi: over 2x faster then wireless* for blazing fast downloads. 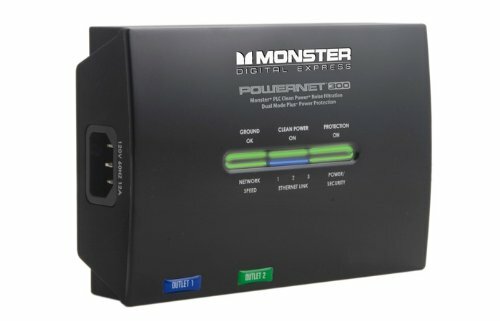 Provides up to 200 Mbps speed between PowerNet units (as much as 48% faster than other powerline adapter products). 4 Ethernet Ports connect up to 4 devices to one PowerNet 300. Secure 128 Bit AES Encryption for easy and safe connections of modems, routers, computers, and AV equipment. Works seamlessly with the PowerNet 100 and PowerNet 200 to extend your home’s high-speed Ethernet network. 2 power protected outlets onboard for easy hookup of computer and AV equipment.